*Avigilon's use of your personal information will be subject to our Privacy Statement. © 2019, Avigilon Corporation. All rights reserved. AVIGILON, the AVIGILON logo, Avigilon Control Center, and ACC are trademarks of Avigilon Corporation. Other names or logos mentioned herein may be the trademarks of their respective owners. Introducing Avigilon Control Center (ACC) 7, the latest and most advanced version of ACC™ video management software. 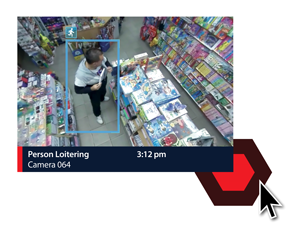 Designed to revolutionize how users interact and gain situational awareness from their video surveillance systems, ACC 7 provides an easy-to-use, AI-enabled user interface helping ensure critical events do not go unnoticed. ACC 7 introduces a new theme with colors specifically chosen to reduce eye strain in dark environments, such as video surveillance control rooms. Depicted features and functionalities may not be currently available and, if and when available, may not be as depicted. Using our self-learning video analytics and Unusual Motion Detection (UMD) technologies, ACC 7 focuses the operator’s attention on the most important events. Introducing a new concept in live video monitoring, Focus of Attention, which leverages AI and video analytics technologies to determine what information is important and should be presented to security operators.